The law firm model likely will change in the coming years as described in our article The Shape of Things to Come – Tradition Gives Way to a New Model! These changes may result in the hiring of fewer traditional lawyers out of law school and the advancement of fewer associates to partnership, the hiring of additional professionals in other legal and practice support and technology roles as well as in important operational capacities like finance, cybersecurity, sales and pricing. Although titles, skills and roles may change, law firms and other organizations will still need to attract top legal and operational talent and will have to build policies and cultures that respond to the preferences of this generation. For purposes of this article, we will focus on the recruiting and retention of top talent, particularly at the millennial generation level. A Harvard Business Review article entitled “What Millennials Want from a New Job” points to the authors’ research findings that 21% of Millennials had left a job in the last twelve months – a rate that is three times higher than non-Millennials, and 60% say they are open to new job opportunities. This indicates that law firms will have to work a lot harder at efforts to retain top employees. Also encompassed within the collaborative culture is the desire of millennials to interact regularly with their managers/mentors (65% preferred face-to-face meetings) and to receive ongoing feedback in real time. They prefer to be coached rather than told what to do but still want to work on a team, not independently/autonomously. Modern Workplace. Millennials have been raised with technology at their fingertips (literally!) We often make an assumption that all millennials are highly tech savvy and interested in technology. This is not always true, however it is true that they expect technology to simplify and expedite what they do. They will expect access to the physical attributes of top technology but also will expect that firms are willing to automate, take advantage of technology to deliver services and value to clients and encourage innovation. Offering millennials a modern workplace also means acknowledging a desire for flexibility in how and when they get their work done to allow for some choices around work-life balance. Many millennials will want more engagement with family and outside interests than earlier generations but will want to be trusted to get their work done remotely and in off-hours. Some have determined that millennials just don’t want to work that hard or are “lazy” or unmotivated. 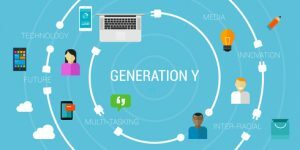 Research finds that in most cases they are willing to and in fact are working as hard as prior generations, but often do so in non-traditional ways. We might do better to define this as a desire for work-life integration than balance, as somehow the latter connotes that they are not willing to work as hard. Strong Mission and Values System. Millennials often are idealists and want to be a part of something larger than a legal task or narrowly defined role. They want the opportunity to grow and ideally to connect what they are doing to something that has meaning beyond the actual project. This generation was born having access to and being connected to a global and diverse world. They will evaluate their employers on the basis of a firm’s values, its mission as a firm, its diversity of thought and people and its contributions to society outside the firm. They admire generosity. This is an area where many firms have slipped in the last decade or so as firms ratchet up the focus on billable hours at the expense of pro bono and outside commitment to causes. Provide meaningful work experiences, making connections between what the legal project is and the relevance to the client, the client’s industry and/or the eventual outcome/benefit. Restructure work assignments so that millennials are working in teams with ongoing mentoring and real time feedback built in. Train partners and others who supervise to be effective coaches and mentors and to provide continuous, effective and constructive feedback (we will write a future blog post on effective feedback); millennials want to learn and grow from feedback. Refine, articulate and execute the firm’s core values and mission; make sure this is clear on the firm’s website and through its initiatives and news. Involve millennials in ways to improve and “live” the firm’s mission and in other aspects of firm management and innovation. Provide opportunities, recognition and role models for charitable and civic work; design a structured corporate social responsibility initiative (these are very mature in the U.K – most have a tab on their web sites, e.g., Freshfields , Clyde & Co. and Allen & Overy. Create a flexible/agile work environment – millennials will get the work done but may not do it all in a “linear” progression or situated only in their offices. Pay attention to the changing law firm model mentioned in the first paragraph and develop alternative career options and paths.